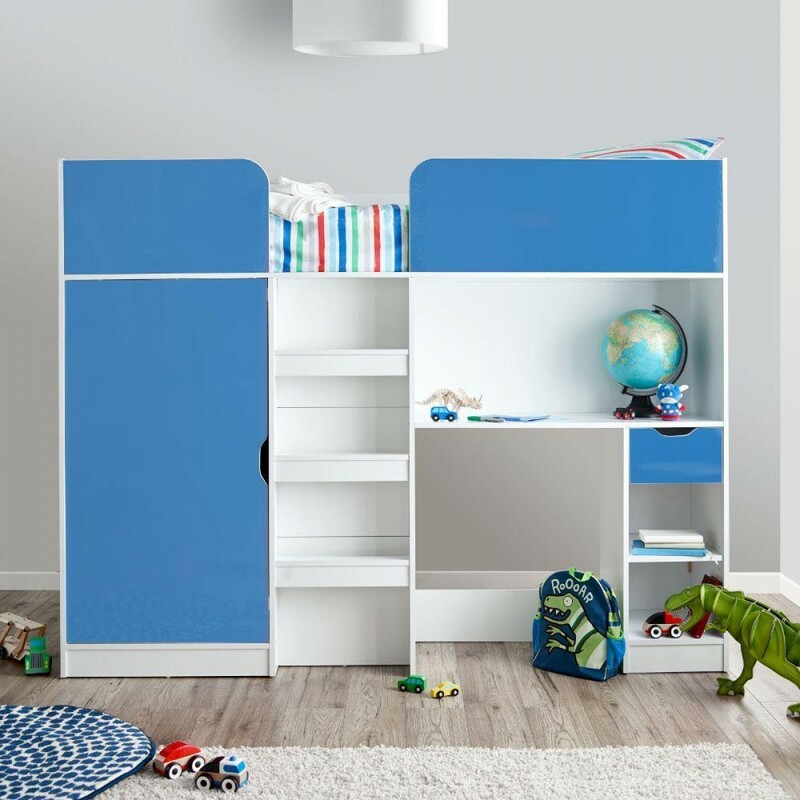 Add a bit of style and adventure to your child or teen's room with the Paddington Blue and White High Sleeper Storage Bed. The Paddington blends an exciting high sleeping space with style and functionality to create a bed that's the perfect space saver. 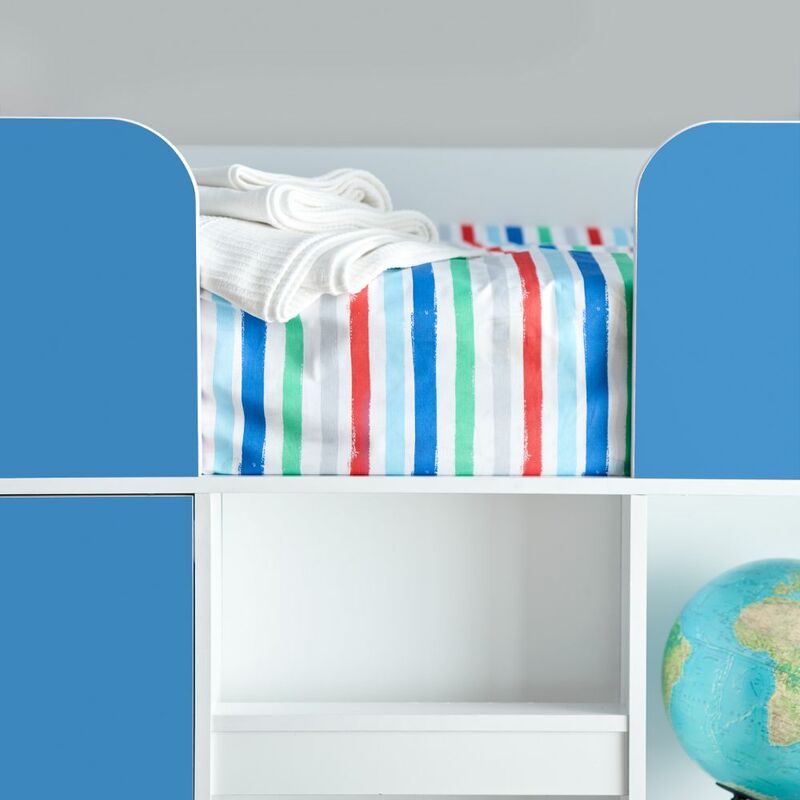 The solid slatted base of the Paddington Blue and White High Sleeper Storage Bed will give a supported and comfortable night's sleep and the raised sleeping space is perfect for children over the age of six. Style is paramount when it comes to a child's bedroom since they always want their room to be the envy of all sleepover guests! Thankfully the Paddington Blue and White High Sleeper Storage Bed is there to help, presenting an option that's both stylish and substantially practical. 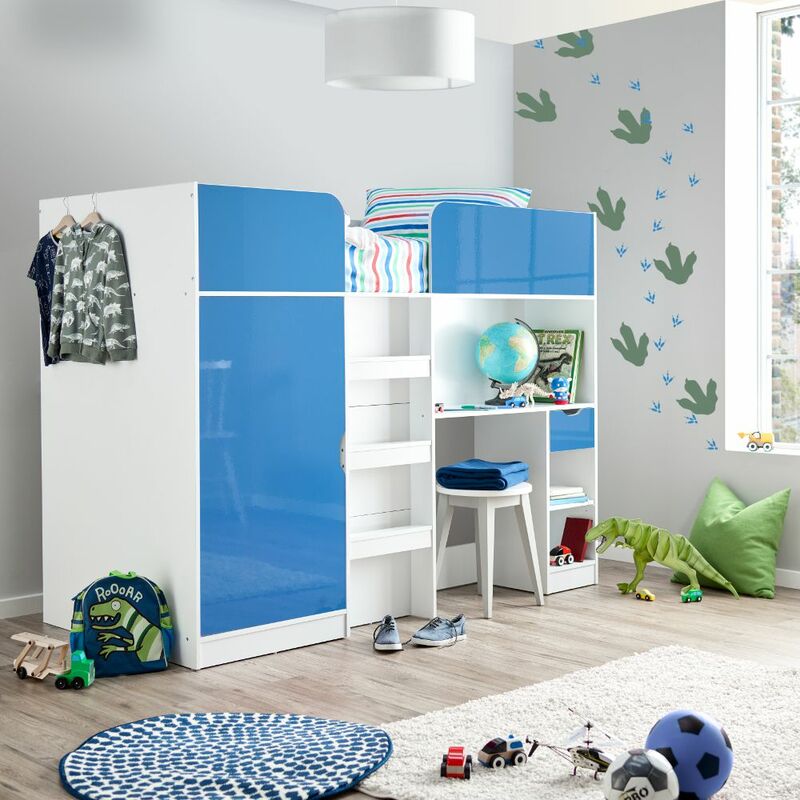 The durable blue finish of the Paddington Blue and White High Sleeper Storage Bed gives a modern and bright feel to any space, and is perfect for kids who'd love a fun statement bedroom. 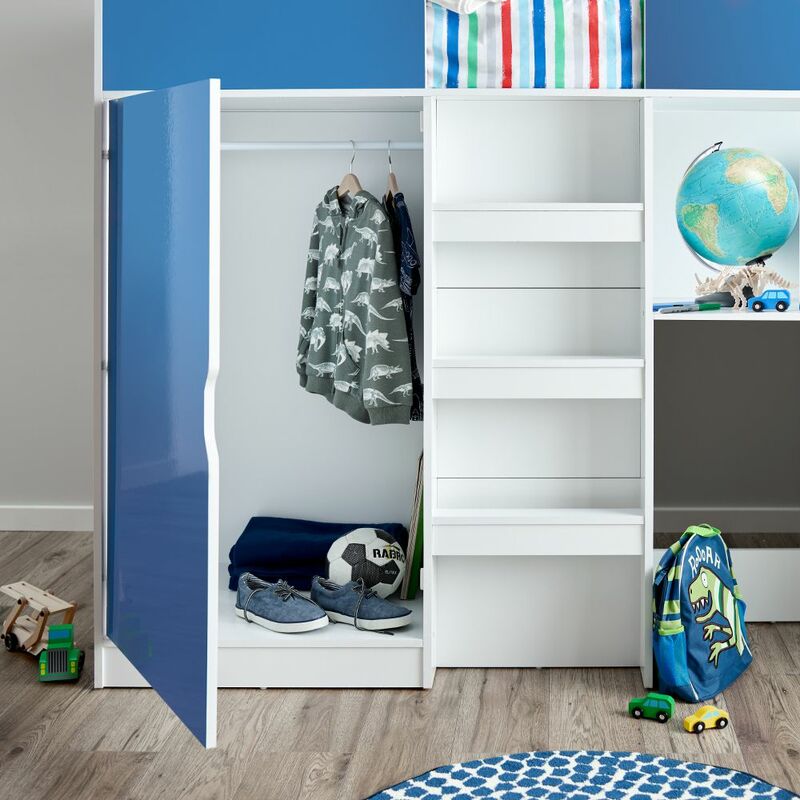 The finish is both durable and easy to clean meaning that, alongside the storage space, your little one will have trouble making excuses for a messy bedroom. Aesthetics and fun isn't the only thing about the Paddington Blue and White High Sleeper Storage Bed; it's also a storage bed with a super practical design. This makes the Paddington Blue and White High Sleeper Storage Bed perfect for smaller bedrooms with limited amounts of storage and furniture space. 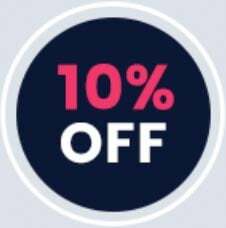 For clothes and other bits and bobs, there is a spacious in-built wardrobe as well as plenty of shelf space and, to make studying a little easier. There's also a desk that's ideal for hosting a computer or laptop. Alternatively, the desk area could be the perfect surface for keeping a TV and putting a sofa opposite, making it the perfect gaming and TV station. 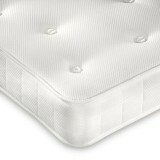 The Paddington Blue and White High Sleeper Storage Bed is crafted from high quality wood and features supportive elements for safety and comfort. 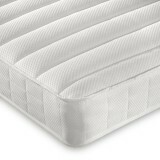 The solid platform base gives support to the sleeper as well as mattress breathability, this air circulation helping the mattress live longer. The flat rung ladder makes climbing up to the sleeping space easy, and the raised safety sides ensure that your child sleeps safely at night.